Shown, from left, are Wes Lynch, intern pastor and director of student ministries at Trinity Wesleyan Church; Rick Kavanaugh, pastor; and for the foundation, the family of Brianna, 7, Erick, Derick, 13, and Georgiana Williams, all of Union City, Indiana. 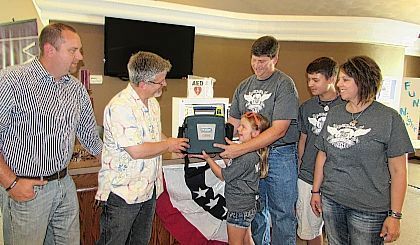 GREENVILLE – The Dylan Williams Forever an All-Star Foundation donated an AED (automated external defibrillator) to Trinity Wesleyan Church in Greenville Wednesday. The mission of the foundation is to bring awareness of the importance of having AED units at youth sport fields and to promote CPR training. Dylan died in 2013 when he was struck in the neck area by a ball during baseball practice, and he went into cardiac arrest. No AEDs were nearby. Donations can be made to the foundation by sending to Citizens State Bank, c/o Dylan Williams Forever an All Star, P.O. Box 427, Union City, IN 47390.